Place your next order with us for outdoor signs, indoor signs, automobile graphics, lighted signs, monument signs, magnetic signs, decals, tradeshow displays, and banners, for both commercial and private applications. 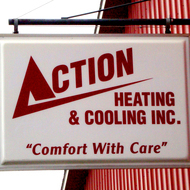 We are a full service, commercial sign company with an extensive product line. 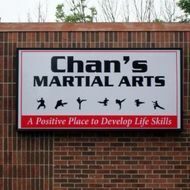 We’re located in Holland, Michigan, but we provide signs throughout the US. Even when we close our doors and go home at night, we're still just a point and click away. From here you can request an estimate, or review our portfolio of products. All from the convenience of your office or home! Holland Custom Signs is here to meet your marketing needs. 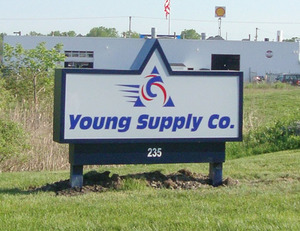 Young Supply completes their move to a new facility with new signs from Holland Custom Signs. They chose a lighted cabinet monument sign for the front of their facility on Hoover St and a wall mounted lighted cabinet for the rear wall of the building but facing Highway 31. Both signs provide excellent advertising exposure and help customers find the new location easily.